This is a wood mudhead clown kachina doll with wool skirt and collar with a feather attached to one of the knobs on top of the head. Small left kachina in the photograph. 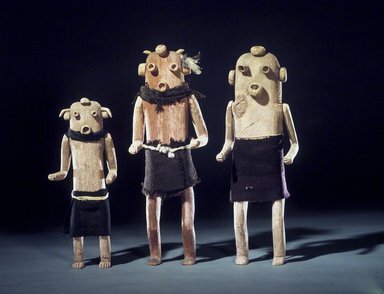 Koyemshi Kachina (Mudhead) Clowns Koyemshi Kachinas, or Mudheads were created when the Zuni first entered the world. One brother and sister had improper relations so their ten children became Mudheads. Each Mudhead exhibits behavior opposite to what their name is. Thus “The Aged One” acts like a child, “The Invisible One,” thinks he is hiding if he only holds up a feather in front of his face, while the all-important “Speaker of the Sun” is really a witless daydreamer and rarely speaks. A troop of ten different Mudhead Kachinas appear in most Zuni ceremonies performing outrageous behaviors and interacting with the audience, making them laugh but also making people realize how wrong such behavior really is as the clowns are eventually chased away.